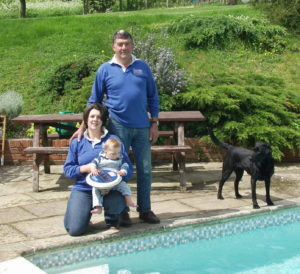 Richard Gibbins (a Hampshire Farmer) and his family have been pool owners for over 40 years and for much of that time lived with the frustrations that most pool owners face – the difficulty of keeping the water fresh, sparkling, and not going green – especially when they are at their busiest on the farm or taking a well earned holiday. In 1998 while on holiday abroad Richard discovered floatron. Having bought one he was so impressed by the benefits to his pool at home in Hampshire, that he and his daughter Emilie became floatron’s sole agent for the UK and many parts of Europe. Emilie’s son Jake, suffers from eczema, particularly after swimming in chlorine, his skin doesn’t react at all in Grandad’s floatron pool! Since then Richard and Emilie have helped thousands of pool owners to keep their pools clean, sparkling and bacteria free. They have also added additional products to their range all designed with one objective – to minimise the cost and time needed to maintain your pool in tip top condition. Learn more about Floatron pool purifiers.